Allan Wexler has worked in the fields of architecture, design, and fine art for twenty-five years. 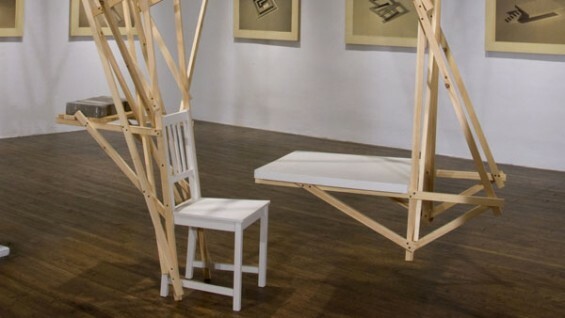 He is represented by the Ronald Feldman Gallery in New York City and teaches at Parsons the New School for Design. Allan’s works explore human activity and the built environment. He works as an investigator using series, permutations and chance rather than searching for definitive solutions. He makes buildings, furniture, vessels and utensils as backdrops and props for everyday, ordinary human activity. The works isolate, elevate, and monumentalize our daily rituals: dining, sleeping, and bathing. And they, in turn, become mechanisms that activate ritual, ceremony and movement, turning these ordinary activities into theater. Allan Wexler and Ellen Wexler are a collaborative team involved in projects that are interdisciplinary. They have included architecture, public and private art commissions and museum education environments. It is by dissolving the boundaries between the fine arts and the applied arts, between furniture design, architecture and theatrical performance, between sculpture and interactive exhibition design and between the practice and the research of architecture, that new ideas and innovation flourishes. “Allan Wexler is an artist whose gallery objects brings us back to first thing: how we keep rain off our heads, how we define space, how we measure our time. He elaborates on these simple acts in form. This is the core of his work. It is a type of experiment with what we think we know: his work confronts us with the unknowability of even the simplest aspects of our daily lives. Wexler accomplishes this revelation in scale models of our reality. He reduces the complexity of our routines into totemic objects. These activities let us stage a ritual re-enactment of daily practices that is up to us as viewers to invent. Wexler makes basic shapes that he elaborates beyond function. He represents what is real in reality itself, and then makes it impossible to come to any simple understanding of his work. Eminently simple yet complex in its implications, Wexler’s work stands as a paradigm for a practice of making, which is beyond either art or architecture.